Posted on February 1, 2016, by & filed under Events, UK Specific, UK Specific. – Salma Karmi Ayyoub, Khalil AlAmour, Jeff Halper, & Anthony Lerman speaking at our 2015 annual conference. 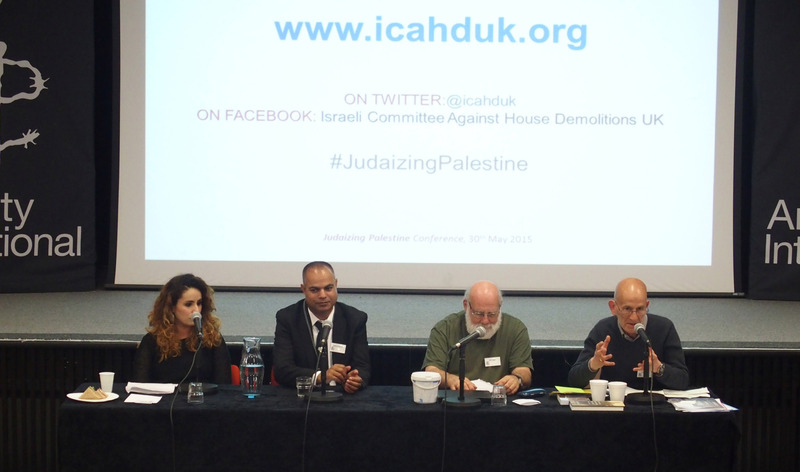 ICAHD 2016 AGM and Conference – Where are we headed in Israel/Palestine? After Israel destroyed the two-state solution what remains is unadulterated apartheid: Israeli Jews ruling over an entire Palestinian people with no national or civil rights and confined to dozens of tiny enclaves on only 10% of their homeland. Apartheid cannot be accepted by any of us, not even by the most fervent supporter of Israel. Israel itself has left us with only one way out: a democratic, bi-national state, a solution called for by almost a hundred Palestinian intellectuals in the Palestine-Israel Journal (2005). Any just solution is impossible, of course, as long as Israel continues its rule over the Palestinians, which is only aided by a collaborationist and by-now unelected Palestinian Authority. The collapse of the PA, a subject of grave concern among Israeli politicians these days, would be a game-changer. Israel would have to physically reoccupy the Palestinian cities and Gaza, enflaming the Muslim world and people the world over, thereby creating an intolerable situation. Are we, the progressive forces, Palestinian, Israeli and international, ready for that? Do we have an end-game, or will we be by-passed when the window emerges for fundamental change in the political situation? What, indeed, are we BDS-ing for? Our keynote speakers include Nabila Espanioly from Nazareth and Jeff Halper from Jerusalem. Nabila has spent three decades campaigning for the civil rights of the Palestinian minority in Israel, for peace between Israel and Palestine, and equal rights for women. She is the Director of the Al-Tafula centre which serves child development and women. Nabila will speak to ‘A perspective of a ’48 Palestinian citizen of Israel’. ICAHD’s Jeff Halper will address the theme ‘BDS for BDS’ (Boycott, Divestment and Sanctions for a Bi-National, Democratic State). Jeff says that apartheid cannot be accepted by any of us, not even by the most fervent supporter of Israel. The Middle East is in flames and we have become part of a global catastrophe which affects us all. Our focus must shift to actually resolving the conflict, not managing it or merely protesting it. The conference will also include information about the BDS campaign in the UK and there will be contributions from previous participants in our annual rebuilding camp and study tours, and a special new film about Atta Jaber will be premiered. In response to the Israeli and UK governments’ trying to suppress BDS activism, we are delighted to announce that Omar Barghouti, co-founder of the boycott, divestment, and sanctions (BDS) movement will be joining us via skype; and Ahmed Masoud, author and theatre director from Gaza, will participate in the Q&A session. This follows Omar Barghouti being banned from leaving Israel/Palestine last week, and receiving ongoing threats of physical violence leading to Amnesty International’s alarmed concern for “the safety and liberty of Palestinian human rights defender Omar Barghouti”. Additionally, Ahmed Masoud will share with us his experience of being denied entry to Palestine earlier this week for a Literary Festival he was due to speak at for the launch of his new book ‘Vanished’. This is a timely call for all those who wish to hear from Palestinian, Israeli and international human rights defenders who support BDS and are working towards a just and sustainable peace in Israel/Palestine. In light of this news, we will be extending our deadline for bookings until 5pm, Thursday 26th May. Please book your place via this link. Please note, ticket price includes lunch, refreshments and an information pack. The conference will be preceded as usual by our members’ AGM: 10:00 – 11:30. Previous invited speakers have included Khalil Al-Amour, representing Adalah; British journalist, author and former hostage John McCarthy; author Ilan Pappe, Professor of History at Exeter University; former MP Clare Short; Baroness Jenny Tonge; Kate Allan, CEO Amnesty UK; Ryvka Barnard from War on Want; & Jeff Halper, ICAHD co-founder.